The Revolution SVR-B Table Tennis Table sits at the high end of Killerspin’s Revolution series. Featuring a pioneering design that has become the definition of tournament-level performance and style, the SVR-B is unmatched in a class of its own. 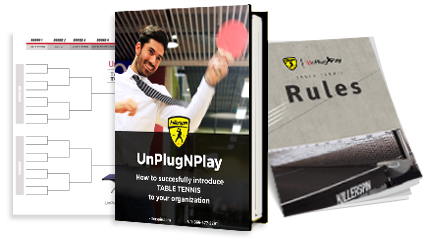 The combination of the exclusive metallic silver arched base and premium black playing surface is show-stopping and adds a top level of refinement to any office, upscale game room, or table tennis club. If you're looking for the best ping pong table money can buy, look no further. Working great. The students were using it the first night it was installed. The table is the best on the market. I purchased one for my office in 2017 and recently bought one for my home. My only comment is, after spending $8k for two tables, it seems a bit "cheap" not to throw in a couple of paddles/balls and maybe a bottle of the cleaner you need to use for these quality tables. I went to Amazon to order what I needed to actually use the table! As a business owner myself, I realize the importance of the "little things" when it comes to customer service. Just a thought! unbelievably amazing ping pong table! Our family loves playing on this table - it is the best we have ever used! Whenever we have guests over they always seem to comment on how cool the table looks as well! Great ping pong table with a sleek design. Love it!